The Exeter Monarchs made it to the final day of the Pro PT Visalia-Tulare Spring Baseball Invitational Tournament but fell short of the championship game. After going 3-1 in pool play, the Monarchs earned a spot in the lower division semifinal on Wednesday, March 27. The semifinal marked a rematch between Bakersfield Christian. It was the second show down in as many days between the Monarchs and Eagles. The results were almost identical. In Wednesday’s semifinal, Bakersfield Christian got out in front of the Monarchs early with a two-run lead in the first inning. The Eagles stretched the lead to five runs with three more in the second. The game was a battle for starting pitcher Garrett Pendergrast who gave up three earned runs on six hits in the first two innings. Freshman Andreas Palomo came in as relief and staved off the Eagles offense allowing no hits and no runs while walking just two batters in the remaining four innings. The Monarchs managed to outhit the Eagles in the semifinal contest and rallied to come back with three runs in the fifth but couldn’t close the gap by enough. Exeter’s Eli Garver went three for four at the plate and scored once while his teammate Jacob Espinola went two for four with an RBI and one double. 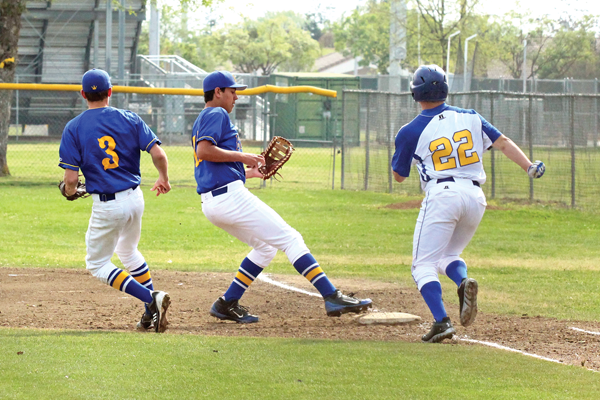 The team’s two other RBI came by way of Cody Tilly and Alex Farias. Out on the field, Exeter’s defense only committed one error while the Eagles gave up three. The two run lead after seven innings advanced the Eagles to the tournament championship at Rawhide Stadium that same night. The Eagles brought down Mission Oak 2-1 to win it all. After going 3-2 at the Spring Tournament, Steve Garver’s Monarchs are 6-7 overall. This week Exeter heads right back into Central Sequoia League play. The Monarchs hosted Kingsburg last night after press time. They will travel to Dinuba for a 7 p.m. game on Thursday, April 5 to wrap up the first round of league play. The Monarchs are seeking their first league win this week after starting off with losses to Selma, 9-2; Central Valley Christian, 5-4; and Immanuel, 9-8.